We’re having a bit of a funny day today, food wise. A friend asked if we could hold a birthday party here for him tonight, and said he would order takeaway pizza. *Takeaway pizza*. I ask you. So I said we’d cook, and indeed I have – a vat of Madhur Jaffrey’s lemony chicken with coriander has been constructed, and Pete will make a big dish of dhal, later. Also two cakes baked this morning. But the party won’t be kicking off until about 9 p.m.for various reasons, and I really can’t wait until then to eat my Indian Feeeeast, so I thought I’d made something a bit more substantial that our usual lunch, and grab a mug of soup later to keep me going. So … to serve two. Removed the green end bits from two nice fat leeks, and sliced the rest into rings. Set them to sauté down in some olive oil and a knob of butter. Put water on to boil for 150g of penne pasta. 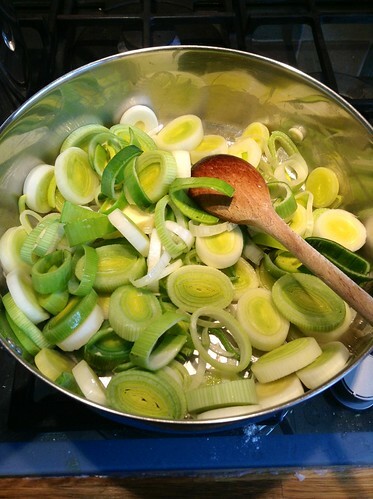 Added a couple of cloves of garlic, finely chopped, to the leeks. Ventured out in the snow for some thyme, chopped and added that. When the pasta was done, added it to the leek mix, and hurled in half a tub of low fat creme fraiche. Quick, easy, tasty. Just under 400 calories a serving. Win.